I have been thinking of writing this post for some time. I love old woodworking tools. They have an aesthetic beauty that many modern tools are missing. They come from a time when form, function and beauty were equally important parts of design and manufacture. My shop is in what had been a small bedroom in our 100 year old home. I can smell a variety of wood-shavings and the hide glue cooking on the bench. Outside the window I see it is a beautiful snowy day. This is the image I tend to emulate when illustrating my blog. This is a set of shelves in my shop. 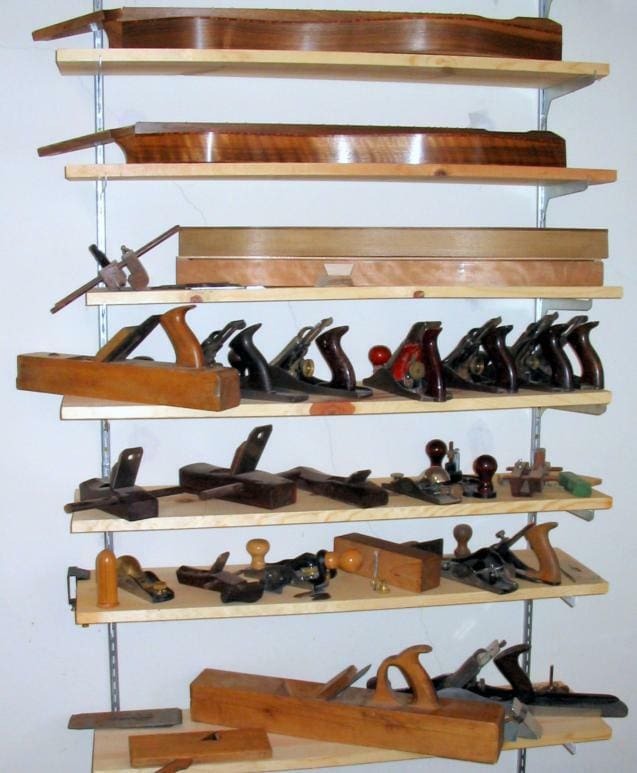 How nice to look at these neatly organized planes and a few dulcimers in progress. Hmmm, not quite as cool and groovy. The grinder has a hard felt wheel I constantly use to keep tools razor sharp. The lovely red and black shop vac keeps everything clean and adds the occaisional relaxing, ambient sounds of a jet engine to the work environment. The air cleaner works pretty well sitting on the floor though I imagine it will work better when I finally get around to hanging it up near the ceiling. 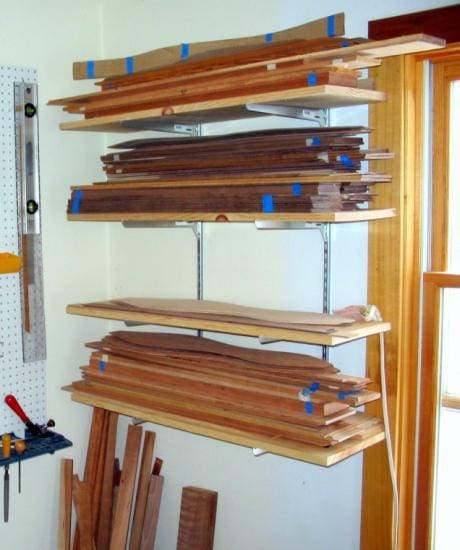 And the small router table and cardboard box of cotton rags makes an attractive display rack for fingerboards in progress, don’t you think? If only they were large enough to accommodate the lining strips and binding on the floor. Almost nice enough for a feature in “Better Shops and Garages” don’t you think? The lovely green plastic handle goes well with the turqoise picture frame on the left. The picture is a collage my wife made for me out of tea bag tags many years ago. 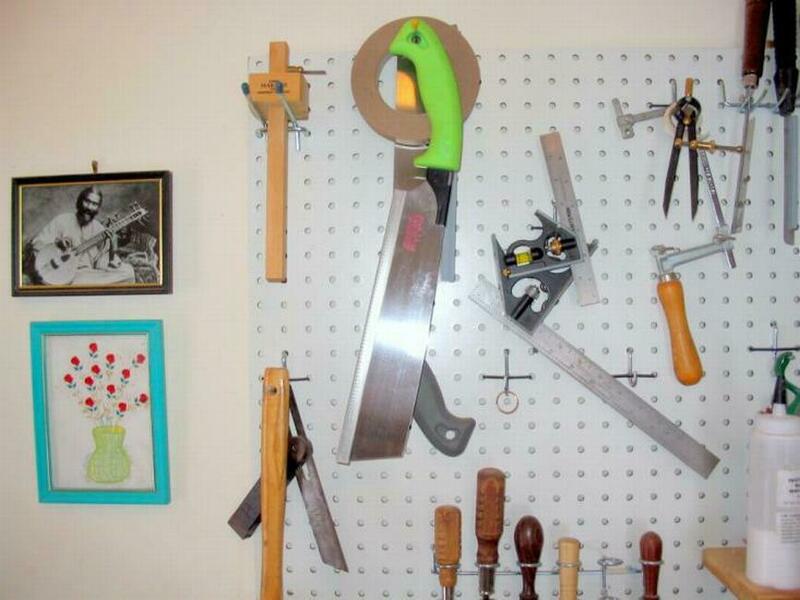 And speaking of my wife, to the right of the gray plastic handle of the saw hiding behind the green one you can see my wedding ring. If it is not on my finger then it is on that hook. I take it off when I work but I always know where it is. Coffee break is over, time to get back on my head………. Inshallah you are always in the space of the Heart! 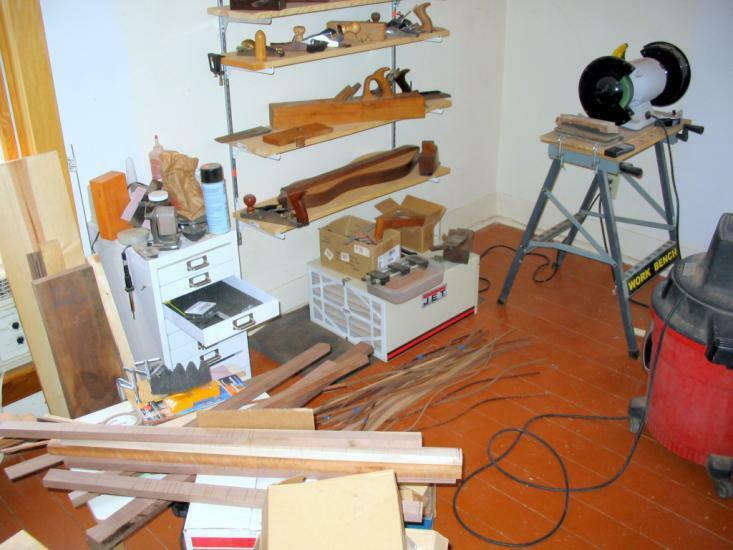 Whatever you say, your shop is neater and tidier than any that I grew up in. It is neat how you can carve out a space, and that space is important. I am spaceless right now and it is a bit like clinging to other people’s rafts and not having one of my own. I took a look at your blog. Very nice! I’d like to link to you if that’s okay with you.